This is my new novel for adults, COVER YOUR EYES. 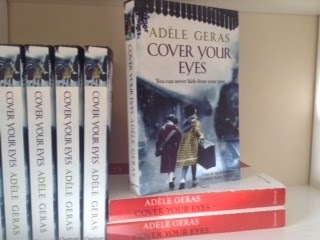 It's published by Quercus Books in paperback and ebook and I have a few things I'd like to say about it which seem to be more appropriate for this blog than for any piece I've written to publicise it. On the face of it, CYE (from now on) doesn't look like a historical novel. There is a young woman called Megan in it and she goes through various romantic vicissitudes. This has been enough to summon the dread term 'chick lit' from one reviewer. However, it's not only a book about a young woman etc etc. There is also a second heroine, who in many people's eyes, including mine, is the real centre of the story. She is Eva Conway...she has adopted the name of the woman who took her in... and she came to England when she was 4 in 1938, which makes her 78 in the novel...it's not quite contemporary. She came here on one of the Kindertransports and that brings the book firmly into a historical realm. I have been obsessed with the Kindertransports for a long time. It strikes me as an almost unbearable predicament. Do you keep your children close, as you want to do, as you feel you really, really need to do, or do you send them off into the unknown, far away from you and with a label round their neck, trusting to luck that they will land with a kind family? There were some children who 'came alone' who were only two years old. When I think about that, that parting, my heart goes into a kind of spasm. I try to imagine myself in that situation....it's the most horrendous possible thing, but it saved lives which would otherwise would have been lost. In 1995 I published a short novel for top juniors called A CANDLE IN THE DARK (A&C Black) This is one of my most successful books, because an excerpt from it was used, years ago in a SATS test. This book is the story of Clara and her little brother Max who come to England in December 1938 and are flung right into the middle of an English family. The children go to the local school which of course is preparing for the Nativity Play. There is much in CANDLE about the feelings of the host child, Phyllis, and the problems she has in adjusting to the arrival of these strangers who have to share her house, her friends, her life. The book I used to research CANDLE is shown below. I have a copy signed by Bertha Leverton, one of the editors. It is a wonderful compendium of first person accounts by people who were part of the Kindertransports and it's a very moving and inspiring volume. I am constantly surprised at the number of people who know nothing about this event in our history. 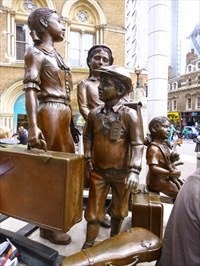 There is now a statue to the Kindertransport children in London, at Liverpool Street Station, so perhaps the knowledge is growing. The facts, very briefly, are these. After Kristallnacht, on November 9th, 1938, when gangs of Nazis destroyed Jewish properties and rounded up many men and took them off to camps, thousands of children were sent out of Germany and other countries of Eastern Europe on trains which took them to Holland where they were transferred to boats which carried them to Great Britain and also to the United States of America. Of the 10, 000 children who were saved in this way, 9,000 never saw their parents again. I sometimes wonder what the reaction would be today if our government announced that it was allowing 10, 000 children to come here from Africa, or Syria or anywhere else in the world. That's by the way. This episode shines out in a dark time for its unusual humanity. And by coincidence, as I write this, Sir Nicholas Winton is receiving a prize in Prague for helping Jewish children escape by rail from Czechoslovakia. He is one of the heroes of this time. It seems that writing CANDLE IN THE DARK didn't end my interest in this time and this historical event. When I began CYE, I knew that Eva was a Kindertransport child. How this would affect the novel I didn't know, but it turned out to be the most important thing in the story and the events which happened back in 1938 inform Eva's subsequent life. They also provide the 'spooky' element in the book, because not only did Eva come to England as a small child, she is also haunted by things that happened on that journey. 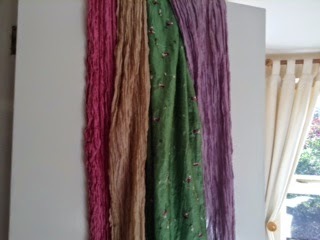 Pictured below is the full-length mirror in my wardrobe...it's covered in a few of my scarves to illustrate something about Eva...she has covered all mirrors since she was seven. This is because something, or rather someone, sometimes comes floating up through the glass....I will say no more. Eva has now retired but she was once a famous dress designer. The novel, I hope, conveys enough of her past to show readers the kind of designer she used to be....she's like Armani, or Jean Muir: immensely stylish and elegant but she has a liking also for the Baroque, the over the top, and especially she's fond of colour and not afraid of it. I trawled the internet for you in order to come up with photos of the kind of thing she might have designed and have found these three images. I can tell you for a fact that Jacqueline Kennedy would have been one of Eva Conway's best customers. But the beautiful thing about writing fiction rather than fact is that you don't have to show anything and you can allow your reader to provide a dress, or blouse or scarf that will be very much more beautiful in their imagination than any real garment. I confess that I did no fashion research whatsoever. I have a kind of mulch in my head, made of the thousands and thousands of images from magazines and movies that I've looked at since I was about 8. 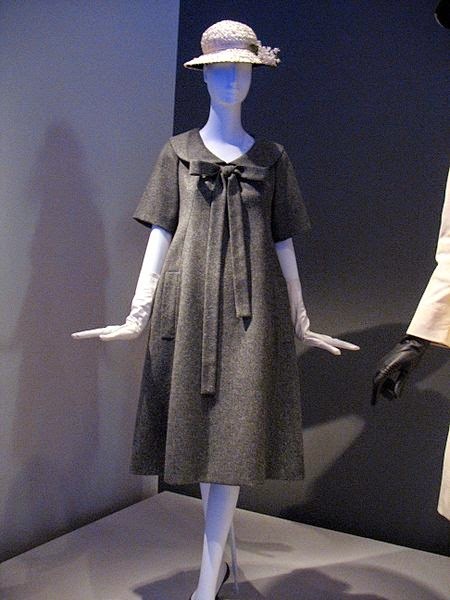 Remember Audrey Hepburn's clothes in Charade? Those could have been designed by Eva Conway. I can conjure any kind of outfit out of my head at the drop of a hat and describe it and it was only the strict attention of editors (and quite right too!) that prevents CYE being full to bursting of descriptions of garments, fabrics, ornaments and so on. I could probably make a short book from the bits of the text that were left on the cutting-room floor, so to speak. I think the present is much more interesting when it's aware of the past; when it looks back in some way. In CYE, Eva's early years are woven through the text, threading scenes set in 1938 and at various times in the 1960s into a story that takes place in the present day. I hope that everyone who reads it enjoys this novel and relishes, like me, travelling magically through time. Those Kindertransports… what a wrench for any parent standing on the station as the train pulls away, or perhaps worse to not be able to see them off at the station. I love the idea that a book with a 78-year-old heroine is described as Chicklit. You break all records, Adèle. The very word Kindertransport makes my chest go tight. It must have been an unimaginable horror for the parents who were left behind. Is the glass being covered related to the tradition concerning souls and portals? I'm also Jewish, and mirrors are special to me (and occasionally terrifying) because of this. I hope so: such an evocative thing with such profound linked emotions, given what happened in Europe. Jacqueline Kennedy? How unexpected. But then, though you created the Ghost Collection, now you've put it in a book it's escaped into the minds of all its readers - and NO WAY, now, is my Eva Conway anything to do with Jacqueline Kennedy! I'm now even more excited about reading your book, Adele! I did not know about that poignant group of statues at Liverpool Street Station - oh, that choice fills me with such horror! Sounds fabulous Adele will order now. Yes have often thought how unliekly today we'd let is 10k Syrian or sudanese or iraqi children, can you imagine. And the sculpture is quite poignant unimaginable horro.